Let's stop the dolphin slaughter! Every signature on the petition makes a difference! 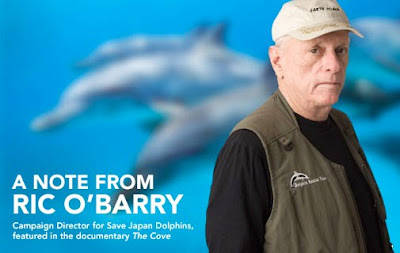 "I hope you'll join me in this campaign to stop the killing of dolphins in Japan. Most people in Japan don't have any idea that the dolphin slaughter is even happening. If we can spread the word around the world - and especially in Japan - we can expose the secret of Taiji and force the Japanese government to stop it. We can win this issue - but we need your help! At the Cove in Taiji, the dolphin killing continues. Although the killing of bottlenose dolphins - the primary target species - has dramatically decreased compared to previous seasons, they, along with other dolphin species, including many pilot whales and Risso's dolphins, continue to be captured for aquariums and slaughtered for meat by the Taiji fishermen. The fight for the protection of all marine mammals goes on. For updates on the situation, visit our Blog." With your tax-deductible donation, we'll send you the newly-released DVD of the award-winning film “The Cove”, as well as other great gifts! August 29th primetime!!! Watch 'The Cove"